I am going to refinish my late 1940s kitched cabinets, but first I need to repair some of the veneer. In some places the veneer is badly damaged, broken, missing. In these areas I removing sections and patching. 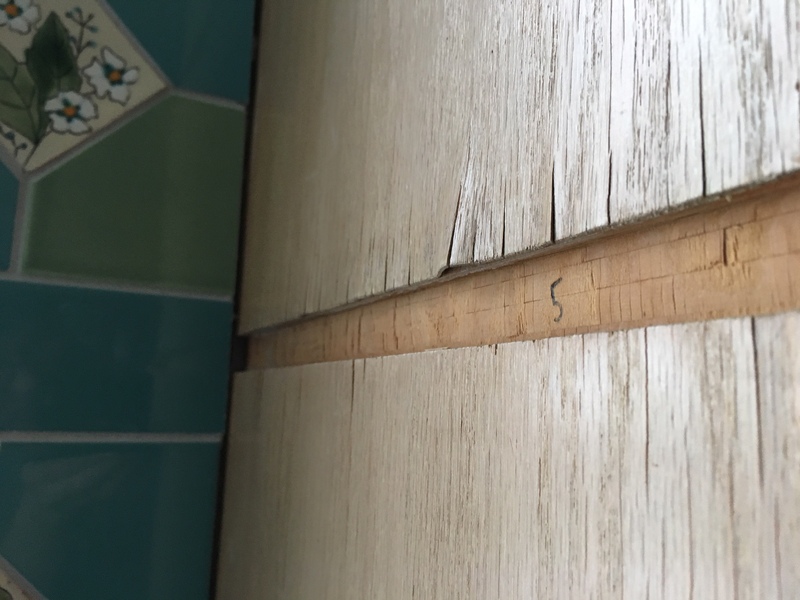 But in other sections, as below, the veneer is peeling off of the surface but it has not yet fallen off (the dado is for a shelf). So my question is, what is the best way to fix this? I have some tiny glue syringes which I could use to get some glue behind the veneer, but then I will have to clamp it, and there is going to be a lot of excess glue. Maybe contact cement? Is there any chance that I could use a wallpaper steamer to gently peel back the veneer and reapply with contact cement? Any other ideas? Browse other questions tagged veneer or ask your own question. How do I prevent chipping when cutting a veneered counter top with a circular saw? Can veneer be patched or do you have to peel it off and start over? How do I remove pencil and lumber crayon marks non-abrasively? How do you tell whether a piece of furniture is veneered?